I learned to keep score when I was in high school, and at this point I have a hard time watching a baseball game without a scorecard in my hands. Here are a few that I’ve used over the years. This is one I’ve used for the last few seasons. It’s a vertical design that can accommodate up to 13 innings. There are spots for 10 pitchers for each team, and three batters per spot in the order. It also lets you keep track of the bullpens & benches as well as the defensive lineup in the field. There is also plenty of room for notes on the back. If you like to total up stats at the end of the game, this scorecard probably isn’t for you. There’s room to note the final linescore on the front and record the winning and losing pitchers, but not much else. 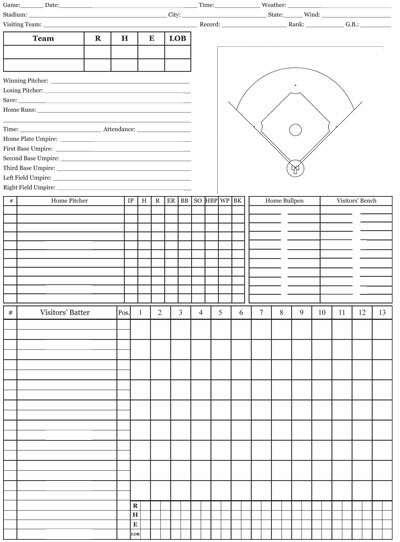 Here’s the scorecard in PDF format, created from scanning a blank paper copy. The original file was made in QuarkXpress, but I no longer have it. This scorecard was created in Adobe InDesign. 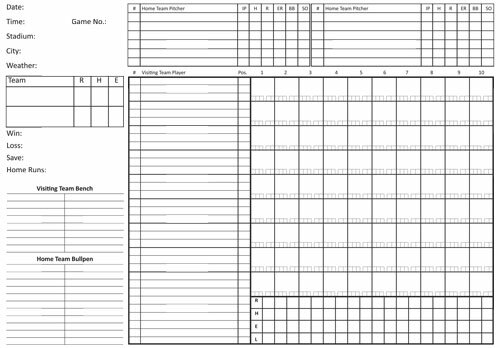 Here’s a horizontal format scorecard that accommodates ten innings. There are spots for 12 pitchers per team and three batters per lineup spot. 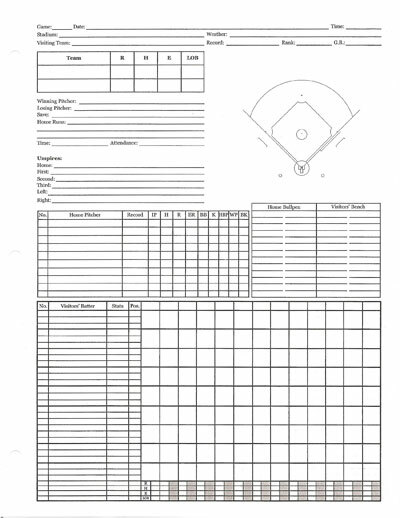 It also lets you keep track of the bullpens & benches, and there are boxes to allow you to keep track of the count when the ball is put into play. There is also a small amount of room for notes on the back. I have not actually used the horizontal scorecard yet; it was really more of a project to work on while getting some experience with Adobe InDesign. Here’s the scorecard in PDF format. I appreciate the detail in both. Could you please send me a home & away version of both in .pdf? Paul, your online resource is amazing. My name is Dave Grant and I am a Sports Broadcaster for Cal Poly San Luis Obispo and soon for the Bellingham Bells Baseball team in Washington. As I prepare for the season I researched scorecards, and yours by far are the best. I am looking forward to a great season and thank you for your design. It was extremely hard to find what I was looking for. Please listen to my broadcasts this season and follow me on twitter @DaveCPMustangs.